Affordable and durable storage solution. Aluminium – lightweight but strong. Smart appearance – finished in a tough silver and black powder coating. Crash Tested to ECE Reg 17. Kit designed specifically for van model. Each kit includes two flat shelves and one angled shelf per unit. Shelves designed to carry majority of tool cases on market. 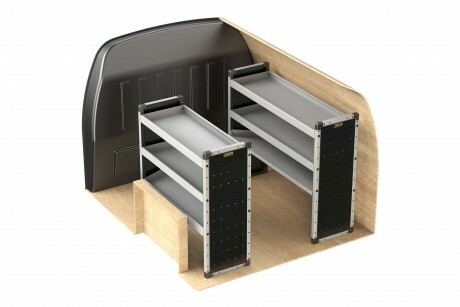 Dividers included for use on angled shelves – adjustable at 50mm intervals. Approximate fitting time: 60 mins. All brackets & fixings are supplied.